Ah macarons. The delightful cookie that strikes fear into the hearts of many bakers. 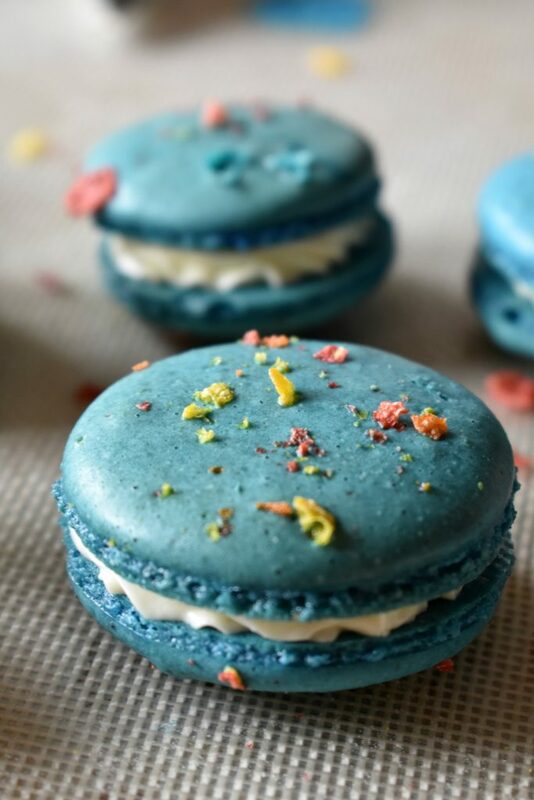 But fear not, I’m here to break down how to make these impressive yet not fussy macarons. It’s true macarons are a little tricky to make, but they aren’t impossible. If you follow my steps and instructions, you can conquer these cookies. Have you ever had a macaron? Macarons are super light cookies, almost chewy in consistency on the inside. The outside of the cookie has a crunchy shell that sort of cracks when you bite into it. It’s very similar to the consistency of meringue. The two cookies are normally filled with some sort of sweet filling. 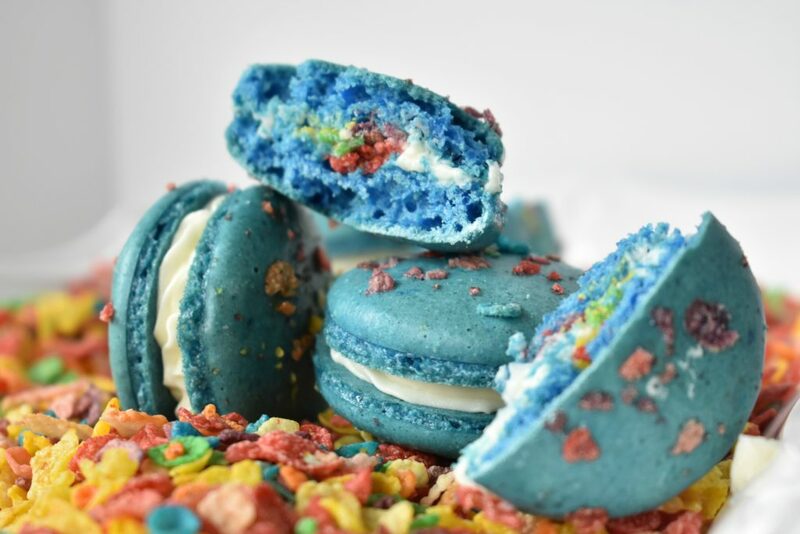 In the case of these Fruity Pebble macarons, they’re filled with sweet buttercream and Fruity Pebbles. Some people get macarons confused with macaroons. Macaroons and macarons are entirely different cookies. Macaroons are chewy coconut based cookies. Sometimes they get dipped in chocolate. Both cookies start with whipped egg whites and sugar to make a meringue base. But coconut macaroons get coconut folded into them and then baked until the outsides are crisp but the insides are chewy. French macarons require a little more love to get right. 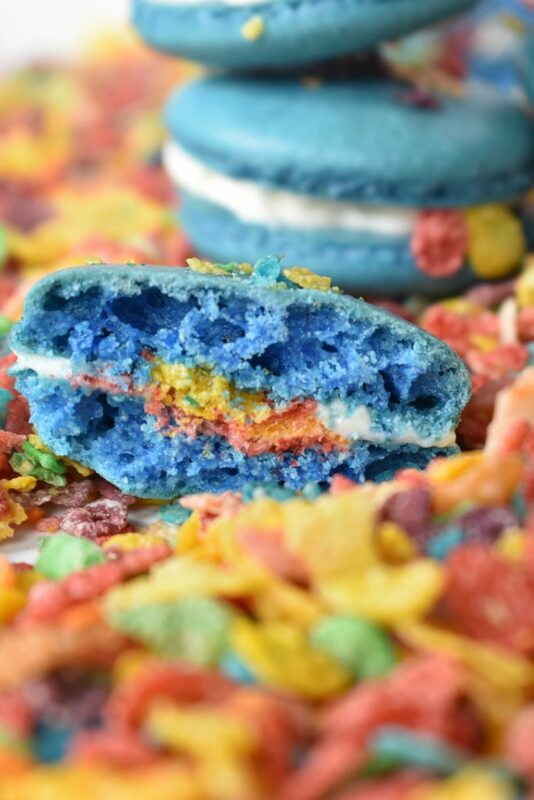 That’s the case with these Fruity Pebble macarons. There’s no cutting corners. For this recipe, I highly recommend following the steps precisely- starting with weighing your ingredients to get the most accurate measurements. This will yield the best results. After you weigh the ingredients, sift together the almond flour and powdered sugar. Then set it aside while you whip the room temperature egg whites and vanilla until they are frothy. Once they get frothy gradually add the sugar and salt in while you continue beating the egg whites until they form soft peaks. When the egg whites get to this consistency, gently mix in the food coloring. Once you have the meringue base made, fold in one third of the dry ingredients. After you fold in the dry ingredients, keep folding the batter gently until there are no dry spots left. Then, you can add the rest of the dry ingredients. After that, you keep folding again until there are no dry spots left in the batter. When you fold the dry spots into the batter, fold slowly. The macaron batter is delicate so you need to be very gentle with it. As you fold, check to see if the batter is forming long ribbons off of your spoon or spatula. You’ll know the batter is ready when the ribbons can form figure eights without breaking. The batter will be thick and sticky. Then you can spoon the batter into a piping bag prepared with a medium round tip. At this point you’ll want to lay a macaron template underneath a silicone baking mat on a cookie tray. Now you can get ready to pipe the cookies. Of course, being that these are macarons and they are on the temperamental side, you have to be very careful when you pipe. Make sure you hold the piping bag completely vertically when you pipe the one and half to two inch circles of batter. Also, make sure to lift the bag straight up after you finish piping each cookie. When you finish piping the cookies, you get to stop being super careful. In fact, you actually must bang the cookie sheet with the cookies against the counter at least 10 times to remove air bubbles in the batter. Keep doing this until you notice the air bubbles have worked their way out of the batter. At this point, you need to let your macarons rest before you can bake them. Do not skip this step. Time and patience are the macaron’s best friends. Your macarons should sit on the counter for up to an hour or until the batter dries a bit and forms a shell. At this point the batter will have set and should hold its shape. Once you notice that the batter has set nicely, preheat the oven to 300 and bake the macarons until they lightly brown, about 15 to 20 minutes. Then take them out of the oven and let them cool completely before you move them off of the baking sheet. While the cool, you can prep the buttercream. When the macarons are cool and the buttercream is ready, fill a piping bag with a star tip with the buttercream. 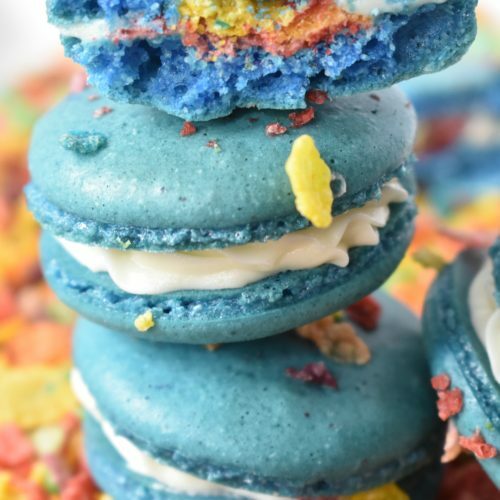 Then pipe a circle around half of the flat side of the macarons and fill the center of the circle with more Fruity Pebbles. Top each iced macaron with one more cookie, round side out. At this point, you can finally enjoy. 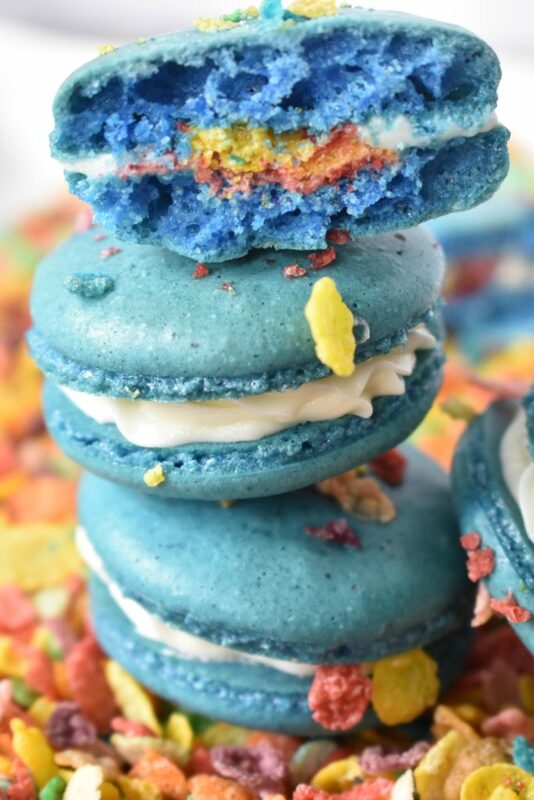 These Fruity Pebble macarons may be a little high maintenance but the end result will knock the socks off anyone you serve these too. Plus, you get bragging rights, because you will have conquered macarons and that means you’re a seasoned and talented baker. Congrats and enjoy! First, weigh out all of your ingredients. Next, sift together your almond flour and powdered sugar in a large bowl and set aside. Add your egg whites to the bowl of your mixer and start mixing on a medium speed until they get frothy. Add in the salt. Gradually add in your sugar to the egg whites and mix on a medium speed until you get a soft peak consistency. Add in the food color to the meringue mixture before adding in dry ingredients. After the egg whites are the right consistency, add about 1/3 of the dry mixture to the egg whites and fold in until there are no dry spots left. Add in the remaining dry mixture to the meringue and fold in until there are no dry spots. Begin to check for the “ribbon” stage, where the batter falls off in ribbons and you can make a figure 8 without it breaking off. Once you get to this consistency stop folding. Prepare your piping bag with a medium round tip. Place your bag in a large cup to make it easier to add your batter. Slowly add in your batter. Place the macaron template under a silicon mat on a baking sheet. Hold your piping bag completely vertical when piping and lift straight up. Making about 1 1/2 to 2 inch circles. Top with crushed fruity pebble cereal if desired. After you have piped all the batter, bang the baking sheet on the counter 10-20 times (seriously) to remove all air bubbles. Use a toothpick or something sharp to pop them. Now it is time to let them dry. Leave them sitting on the counter for 30-60 minutes until you can touch them and you can feel a “shell” form over them. No batter should come off on your finger. preheat your oven to 300 degrees F. and bake your macarons for 15-20 minutes or until lightly browned. When you touch the top of the macaron it should not wiggle around on the “feet”. Allow them to cool COMPLETELY before taking them off the baking sheet. Cream the butter until light and fluffy in a stand mixer or using a hand mixer. Slowly add in the powdered sugar, then add in the cream and vanilla. Add to a piping bag, or Ziploc, with a small star tip. 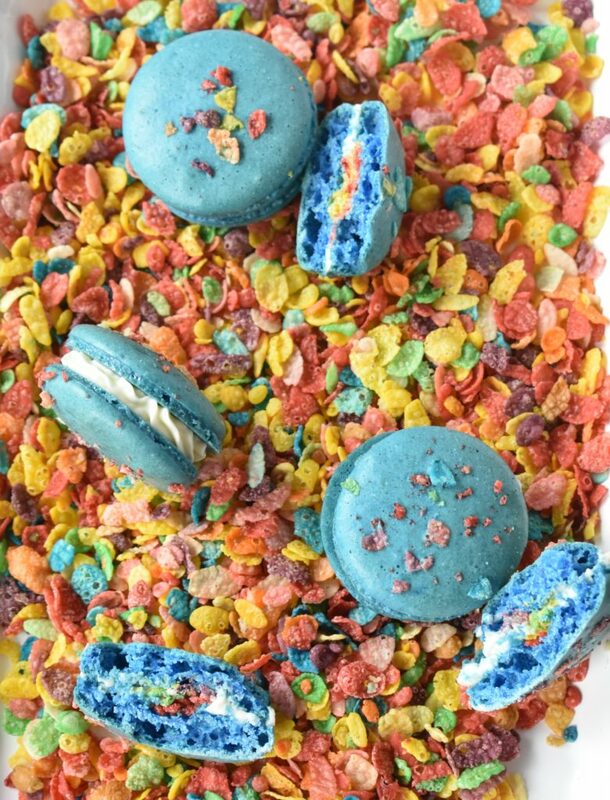 Pipe a circle around half of the macaron shells and add fruity pebbles cereal in the middle. Sandwich them with the remaining macaron shells. Keep in an airtight container in the refrigerator for 24-48 hours to allow them to “mature”. Enjoy! These look so pretty!! Thanks for sharing at Fiesta Friday party!